The popular mobile game Angry Birds has taken cell phones users by storm. Created by Rovio Mobile in Finland, the game began as an application for the Apple iOS and was originally only available for purchase through the Apple App Store. As the popularity of the game grew, Rovio Mobile re-worked the game to be played on more devices, with the most widely used one being the Android. Since the game's release on the open market in 2009, many have touted the game as being an addictive application that pulls players in by seeing just how far they can get those birds to fly and break down increasingly difficult structures. Falling green pigs also helped to propel the game's popularity and garner various awards, including the double win of App of the Year and Best Game App for the 2011 United Kingdom’s Appy Awards. 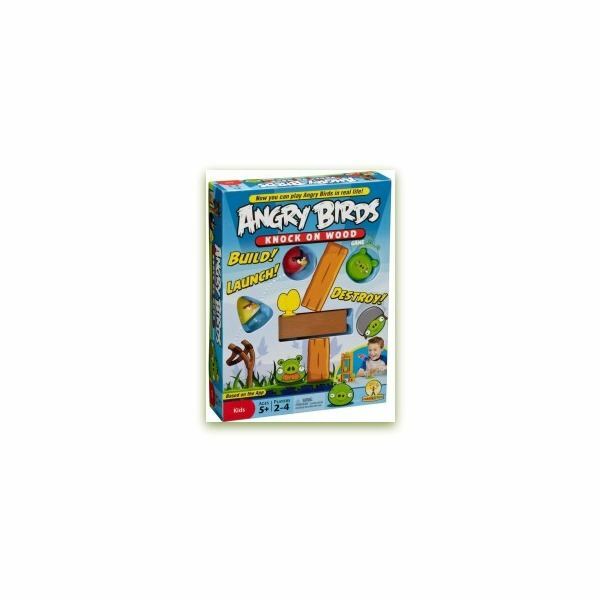 With such popularity happening across the globe for a simple game of skill and humor, the Mattel company decided to produce an Angry Birds board game. 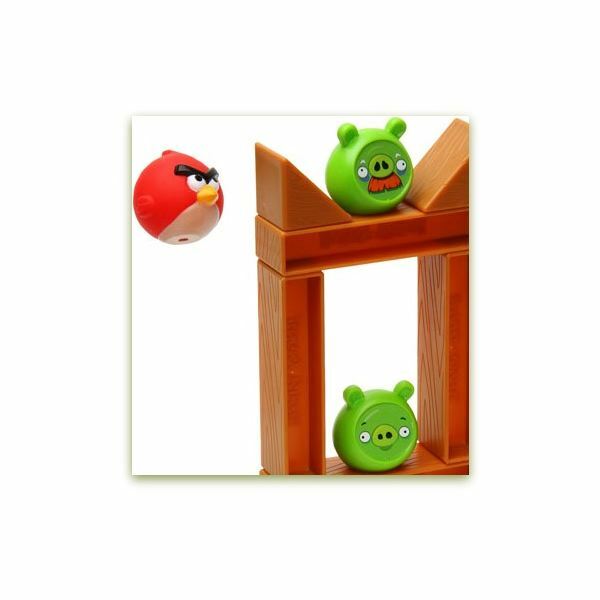 In conjunction with Rovio Mobile, the toy company released the Angry Birds: Knock on Wood tabletop game in May of 2011. Here, we take a closer look at the board game and review the gameplay when you take it offline. The board game does not come with all of the items seen during mobile gameplay. Mattel does not include stone or glass blocks, but the standard wood planks and blocks are there in plastic form. An addition to the board game is the mission cards. These cards instruct players on how to build a structure to be knocked down. The premise, as with any Angry Birds game, is to take revenge on the pigs by knocking them out. One player represents the birds while another player builds the structures. Before the slingshot action can begin, a player must pull a mission card. Next, the player who is representing the birds takes the slingshot and loads it with a bird. The player aims the bird and then launches it at the structure in an attempt to knock the structure down. If the structure is still standing after the first bird, the player will then launch the remaining birds to topple the structure. If the structure is broken down and the pigs defeated, then the bird player gets the points shown on the mission card. 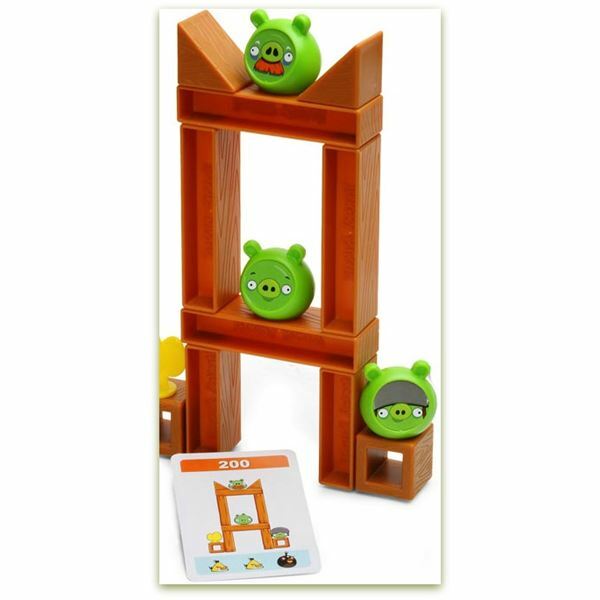 If the structure is not destroyed, then the bird player does not receive the points and will have to try again with either the same structure or another structure pulled by the pig player on a mission card. With the exception of the mission cards, the gameplay has the same feel as that of the mobile app. The game is fairly easy to set up and start playing. Listed as being for players between 5 and 9 years old, there are some mission cards in the high end level that pose a bit of a challenge when creating the structure. Some of the structures have to be balanced as delicately as one would build a house of cards, and if the table is moving or is bumped, the structure can topple over before a bird gets launched. A good way to handle this is by playing the game on a sturdy flat surface that won’t be moved around when players lean on it. One problem with playing the game on a tabletop is in the clean up. The clean up itself is an ongoing part of the game and not just for after the game is done. Each structure is knocked down by a flying bird, this means that the structure pieces and the pigs will get tossed about a lot. Be prepared to gather up game pieces knocked off the table at the end of each launch.